PP9, Energizer 276, Eveready PP9, NEDA 1603 Battery. Type: Zinc Carbon. Voltage: 9V. Depth: 51.5 mm. Width: 65 mm. Height: 80 mm. Connector: press stud full-size snap connectors. Price: £6.88 each. £6.38 each if you buy two or more. Postage and packing for this PP9 (276) battery included. and also Varta 439, Saft ST9, Ray-o-vac RR9, Drydex DT9, GEC BB29, Siemens TR9, Vidor VT9 and Vidor T6009, Burgess M6, IEC 6F100, . 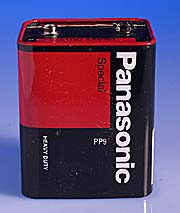 This PP9 or 276 battery is used in a wide variety of meters, vintage radios and other devices. For example, this hard-to-find Ever Ready PP9 or 276 battery is used in vintage collectible transistor radios such as R250, Bush TR130, TR82C and many other 'oldies goldies' transistor devices. Further PP9 or 276 batteries are used in a variety of medical equipment and fire alarms/detectors. In addition to the popular Roberts R250, this PP9 or 276 battery is also used in Roberts model R550, R757 and R760. This PP9 or 276 battery is of zinc carbon chemistry. This PP9 or 276 battery has larger snap connectors than the popular PP3 9V battery. These PP9 or 276 batteries have a long shelf life. Take advantage of our reduced price order two or more packs just so that you are not left without your vintage radio next time the PP9 or 276 runs out on you.